With all of the recent buzz about the devaluation of many hotel loyalty programs I thought it would be the perfect time to review exactly what has changed and where each hotel loyalty program stands. In January, Starwood announced that its Cash & Points redemption options will change on March 5, 2013. The Bottom Line: The devaluation of Starwood’s points will make it harder to get high value yielding redemption (often 3 cents per point in value when using the Cash & Points redemption). The new option to redeem Cash & Points for upgraded rooms and suites will make upgrades for elites harder to come by. On the other hand, Cash & Points redemption can now be made at all Category 1 and 2 hotels worldwide and non-elites will be able to redeem Cash & Points for suites if they so choose to desire a bigger room. Last week, both Marriott and Ritz-Carlton programs announced major changes that will begin on May 16, 2013–both of which were not good news for loyalty program members. Marriott’s updated award level categories. The Bottom Line: With only 35% of the Marriott properties moved to a higher category, the devaluation is not as broad as some other programs, but the percentage of devaluation may be greater for properties that were elevated up more than one category. If you plan on booking a stay with Marriott using your points, it would be wise to take a look at the category changes that go into effect. If your property is being moved to a higher category, make a reservation before the change takes place on May 16, 2013. Hilton recently announced a major devaluation of the HHonors program that goes into effect March 28, 2013. 5th night free benefit for elite members–Silver, Gold or Diamond elite status members will get a free night when they book a Standard Room Reward stay of five or more consecutive nights. The Bottom Line: While award redemption with the new 10 category chart start at only 5,000 points, the amount of points needed for top tier hotels went up considerably. For example, some Conrad properties that used to be 50,000 per night are increasing to 95,000–a significant and unfriendly increase for consumers. The ‘seasonal’ hotel reward pricing is very vague and doesn’t provide any rules or dates–Hilton only offers you to search on their search tool to determine what this means. On the other hand, the 5th night that will be given on award bookings of five or more nights matches what Starwood and Marriott already offer. There is also no word on how award pricing will change for Hilton Amex cardholders (AXON) and discounted awards for elite member (GLON). Priority Club’s new award chart went into effect on January 18. The Bottom Line: Yet another devaluation and increase in redemption categories. Although the devaluations are not across the board, it ultimately shows that there is a move to increase the amount of points for the most desirable hotel tiers–Crown Plaza, Indigo, and Intercontinental. Priority Club is offering a grace period and if the amount of points needed to book your award night increases, you can call Priority Club directly through March 18 to ask for the original point price. Unchanged: Both Club Carlson and Hyatt remain unchanged and hopefully do not take suit and follow the rest of the loyalty programs devaluations. 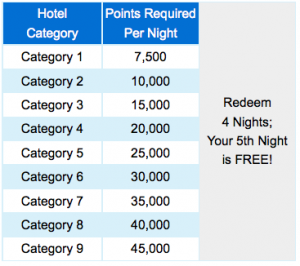 With all of these new changes and increases in the number of points needed to book a room, how much do you have to spend at the hotel to earn one free award night at a top-tier hotel in each chain? Hat tip to The Points Guy for the numbers. $15,000 for a free night at a Starwood Category 7 property (30,000 points at 2 points per dollar spent) or $7,775 for Cash & Points for 15,000 points (at 2 points per dollar) plus the $275 co-pay. The Bottom Line: With the exception of Club Carlson, you are going to have to spend a lot more money to earn a free night at your hotel that you are a loyalty member of. 2013: The Year of Hotel Devaluations and Alternative Options for Stays? Thus far 2013 has been an incredibly bad year as far as devaluations in the hotel points industry, and it occurred across the board with the exceptions of Club Carlson and Hyatt. Hopefully the hotel brands realize that they are going to lose customers to other programs with a more competitive loyalty program and one that actually values loyalty members. Although there are free stays to be earned from sign up bonuses, when the numbers are crunched it shows that it takes a lot of spending at your hotel of choice to earn a free night at a top-tier hotel in their program. The programs certainly are not being generous to their loyal customers and I think they will see a backlash from that customer base. With all of the loyalty program devaluations, 2013 may be the year many of us look for other options for stays–boutique hotels can be found at cheaper prices and offer more unique experiences and amenities, Airbnb is constantly growing and provides some great places for less than the big hotel chains, and VRBO is a wonderful way to book a place for a longer stay or for a larger place. How have the recent changes made you rethink your hotel stay strategy in 2013?